Dudley is a big chocolatey pile of love. He’s a textbook lab. I would say he’s medium energy level (a couple of walks per day). He enjoys treats and chewing on things like Nylabones: I think he would also like tug of war. 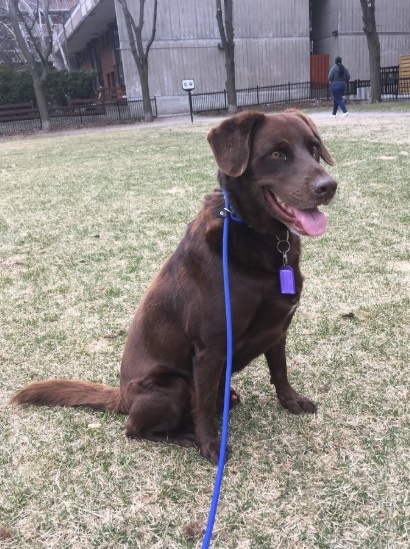 Dudley is the most easy-going dog I’ve ever been around: he loves being around other people and dogs, is highly trainable, loves his crate and lots of big naps. I’ve never heard him bark, although he sometimes whines in excitement when we see another dog outside. He does pretty well in the city, but is a little nervous about loud noises like fire trucks. Dudley has shown some interest in squirrels but can easily be refocused with a simple “no.” He is also fully housetrained! No accidents at all. I think the best home for Dudley would have people around a lot and maybe another dog. He’s so sociable! He would be an amazing family dog. I would also say he’d benefit from a family willing to continue to work with him on leash training and manners—he’s so gentle and sweet, he’ll blossom really quickly.